Colorado is an attractive state to raise a family. The unemployment rate is low and the state offers access to some of the best natural attractions in the country. Home prices are also on the rise in Colorado, so if you’re planning a move to Colorado you may want to do so soon. 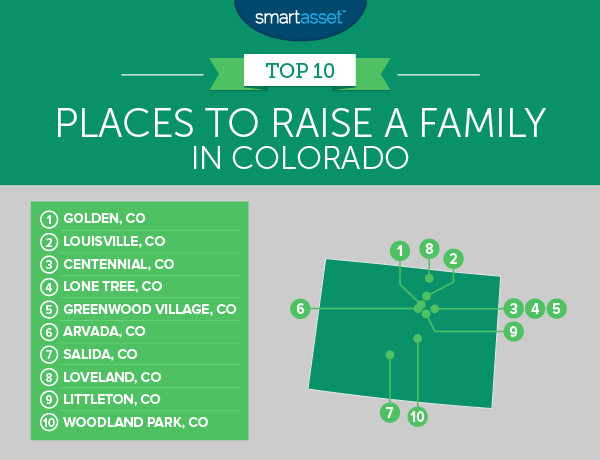 Below we rank the best places to raise a family in Colorado. Buying a home in Colorado? Check out current mortgage rates. In order to rank the best places to raise a family in Colorado, we looked at data on 10 factors. We looked at metrics like percent of families living in poverty, high school graduation rates, percent of residents who are children, average housing costs, median household income, crime rate, annual cost of placing a child in a care center and percent change in home values. Denver suburbs are best – While Denver itself ranks fairly low (30th), the cities and suburbs around it tend to rank much higher. Cities like Golden or Centennial, for example, both rank in the top 3. Pricey but worth it – Many of the cities in our top 10 have a high cost of living. The average median housing cost across our top 10 is over $1,300 per month. Golden takes the top spot for best places to raise a family in Colorado, thanks to high scores in pretty much every metric. This city saw median home values rise 22% from 2011-2015, the fastest rate in the study. This city also has an unemployment rate of only 4.3%, the second-lowest in the study. On top of that, crime here is low. Golden ranks sixth for lowest property crime rate, with 2,063 property crimes per 100,000 residents, as well as ranking eighth for lowest violent crime, with 136 violent crimes per 100,000 residents. Louisville is a great place to raise a family. The schools in the area have an average graduation rate of 89%, one of the highest in the state. Plus, the city is relatively crime free. Louisville ranks first and second, respectively, for lowest rates of property crime and violent crime per 100,000 residents. But in order to move to Louisville, you’ll need to be ready to handle the high costs of living. Median housing costs in the area are over $1,500 per month and the average annual cost of keeping a preschooler in a child care center is over $13,000. Centennial, a suburb of Denver, is a great city for families looking to ensure a promising economic future for their children. The median household income here is just under $92,000 per year and the unemployment rate is only 5.3%. For both of those metrics, Centennial ranks in the top six. The city is also home to a large number of youths. With over 26% of the residents being under the age of 20, children will have no shortage of friends. Centennial ranks 17th in that metric. But those benefits come at a cost. Specifically high housing costs. Raising a family in the average home in Centennial will cost over $1,550 per month. The good news is that mortgage rates in Colorado are trending down, which will help more people afford homes. Lone Tree is a wealthy city located in Douglas County. The average household here earns over $110,000 per year and only 2.7% of families fall under the poverty line. For both of those metrics, Lone Tree ranks second in the study. Lone Tree also has the best score for percent of residents under 20 in our top 10. Overall around 28% of residents here are under the age of 20. One thing to keep in mind is that average housing costs are really high. If you move your family to Lone Tree, you are looking at spending around $1,800 per month on housing, on average. Greenwood is the wealthiest city we analyzed. Households here earn around $117,000 on average. Home values in the area are also on the rise, a great sign for families looking to lay down roots. From 2011 to 2015, median home values rose over 10%. For parents looking for jobs, Greenwood is a tough place to beat. The unemployment rate in the area is only 3.5%. Arvada is one of the most populous cities in Colorado, with a population over 100,000. This would be a good city to raise your family because of the great schools in the area. Overall the average graduation rate in the Arvada area is over 82%. Another plus to raising a family in Arvada, is that you can live relatively worry-free when it comes to safety. Arvada has the seventh-lowest property crime rate in the country, with only 2,500 property crimes per 100,000 residents and the 12th-lowest violent crime rate, with only 135 violent crimes per 100,000 residents. However if you are raising young children in the area, one thing to be wary of is the cost for care centers for young children. Our data shows, on average, it costs over $10,000 per year to keep your preschooler in a center. 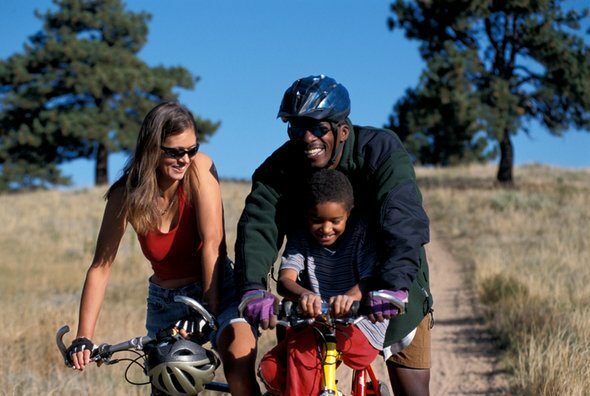 Salida is an affordable option for people looking for a safe place to raise their family. 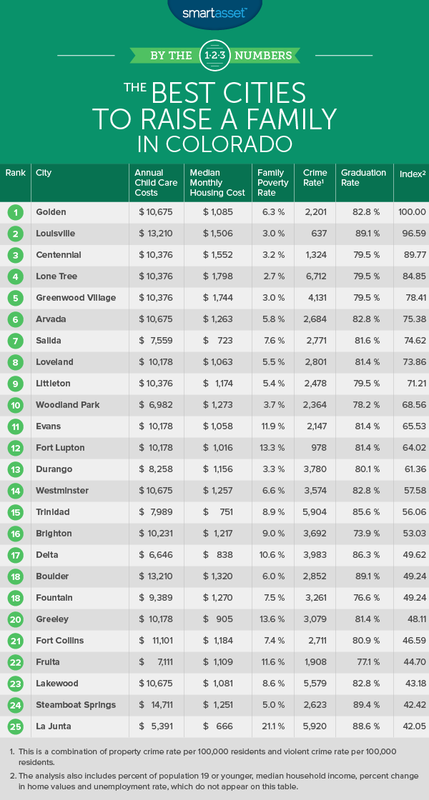 Our data shows that average housing costs in Salida are around $724 per month, less than half of what they are in some other cities in our top 10. The city also has the lowest violent crime rate in the study at 73 per 100,000 residents. One of the largest costs families face is taking care of their infants while the parents are working. In Salida, the average cost of caring for infants is lower than it is in many other cities. Our data shows that keeping a preschooler in a care center year-round costs just over $7,500 in the Salida area, ninth-lowest in the study. Loveland takes a balanced approach to raising a family. This city scored in the better half in every metric we analyzed. About 5.5% of families in Loveland live below the poverty line, which was the 10th-best score in the study. The city also is a safe one. Its property crime rate was the 13th-lowest in the study at 2,570 per 100,00 residents. Furthermore home values were up over 6% from 2011 – 2015, the 15th-fastest increase. Littleton is another relatively crime-free city in Colorado. Overall this city had the eighth-lowest rate of property crime per 100,000 residents and the fourth-lowest rate of violent crimes per 100,000 residents. The economic situation is Littleton is also very bright. This city has an unemployment rate of only 6.2% and the average household earns over $65,000. A drawback to Littleton is the relative lack of other young families. Only about 22% of residents in Littleton are under the age of 20. Woodland Park rounds out our top 10. This city has a lot going for it when it comes to raising a family. First off, there are plenty of other kids in the area meaning plenty of friend-making opportunities for your children. About 28% of residents are under the age of 20. Plus, the cost of raising your kids in Woodland Park is relatively affordable. For example, keeping a preschooler in a care center in the Woodland Park area will cost less than $7,000 per year on average. Percent of families under the poverty line. Data comes from the Census Bureau’s 2015 5-year American Community Survey. High school graduation rate. This is measured at the county level. Data is for the 2015-2016 school year, and comes from the Colorado Department of Education. Percent of residents under the age of 20. Data comes from the Census Bureau’s 2015 5-year American Community Survey. Median housing cost. Data comes from the Census Bureau’s 2015 5-year American Community Survey. Median household income. Data comes from the Census Bureau’s 2015 5-year American Community Survey. Property crime rate. This is the number of property crimes per 100,000 residents. Data comes from the FBI and local authorities, and is from 2015. Violent crime rate. This is the number of violent crimes per 100,000 residents. Data comes from the FBI and local authorities, and is from 2015. 5-year percent change in median home values. Data comes from the Census Bureau’s 2015 5-Year American Community Survey and the Census Bureau’s 2011 5-Year American Community Survey. Unemployment rate. Data comes from the Census Bureau’s 2015 5-year American Community Survey. Child care costs. This is the average annual cost of keeping a preschooler in a care center. Data comes from 2014 and is measured at the county level. First we ranked each city in each metric. We then found each city’s average rating giving a half-weighting to our two crime metrics. Using this average weighting we created our final index. The city with the best average ranking received a 100, the city with the worst average ranking received a 0. Buying a home can be a stressful and expensive process, especially for young families. But one way to save money in the long term is to make sure you are getting a low mortgage rate. One method for getting a low mortgage rate is to pay a large down payment. The larger your down payment, typically the lower your mortgage rate will be. A larger down payment will also mean your monthly housing costs are lower. Of course, saving up for a large down payment can take a long time and may not be feasible for everyone. Another method for getting approved for a lower mortgage rate is to improve your credit score. While some things on your credit score cannot be improved in the short term, some can. Take credit report inaccuracies. By getting inaccuracies off your credit report you can immediately boost your credit score. Generally speaking, the higher your credit score, the lower your mortgage rate.